So I’ve been out of the loop for a while now having lost touch towards the end of my pregnancy. I am now the proud Mama of a precious baby boy Emerson Reid, 6 lbs 9 oz born 7/8/10. Having had quite a few orders to complete before his birth, it was all I could do to get the paintings done so unfortunately I did not get photos of them much less posted on my blog! As much as I hate it, I just couldn’t make it happen…hoping to make up for it now!!! 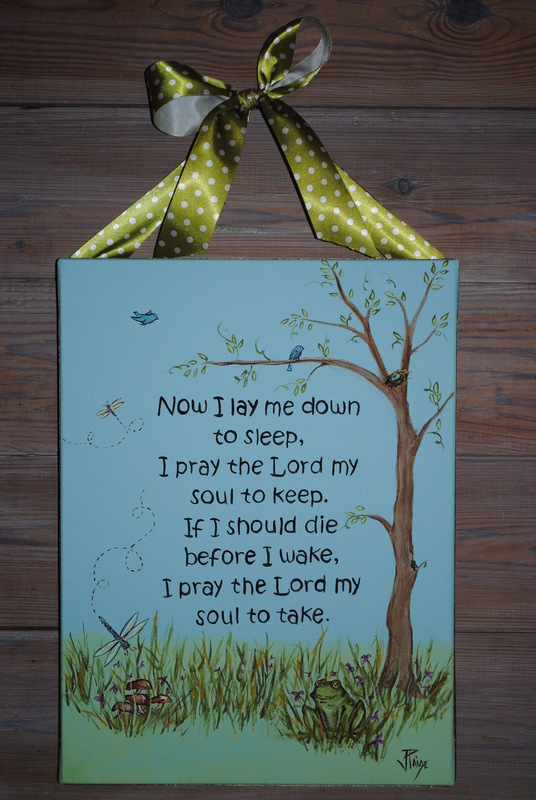 That being said, several months ago I had an order for a popular childrens prayer to be painted for a little girls room. Boy I didn’t realize what a hit it would be!! So many people wanted one, only in boy versions, this is the one I just finished and the only one I got a picture of. Happy Friday! Thank you so much Julie! I love it!! Love this! The green ribbon is really cool…. and I love that frog! You need to share a picture of that precious baby with your blog readers! Just sayin’! This is adorable Julie! You’re so talented! Love this prayer too! OMG!! WOW! I LOVE IT! I still need one for the boys room….. hmmmm so cute! !